As seen in Racing Victoria's Inside Racing Magazine. New Equine Limb Injury Prevention Program research indicates that any horse rested from training for longer than a week has developed de-adapted bone and is at risk of injury from excessive high speed work; thus a return to high speed training should be gradual. Stress fractures, small cracks and focal injuries in the subchondral bone (‘bone fatigue injuries’) are common at the base of the cannon bone of racehorses (Fig. 1). They occur because of the accumulation of damage to the bone from repetitive high-intensity exercise. During training, the horse’s bone adapts to even short bursts of speed by laying down new bone to increase the total amount of bone (a process called modelling, Fig. 1). Damaged bone is also repaired by being removed and replaced by fresh new bone (remodelling). The modelling and remodelling process increases the bone’s resistance to injury. 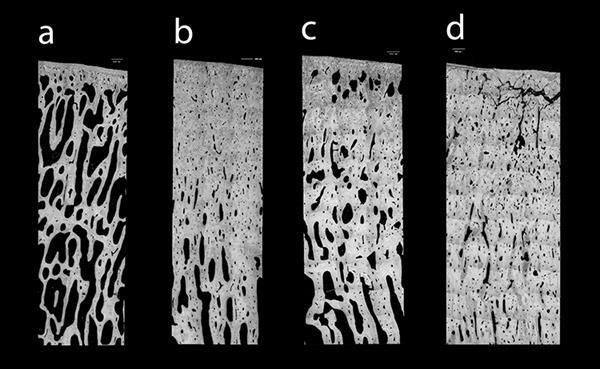 Figure 1: (a) bone unadapted to training; (b) bone adapted to training; (c) bone adapted to rest; (d) microcracks - these can accumulate and propagate into a stress fracture, and may progress to catastrophic fracture. The grey represents mineralised bone. Source: Modified from Martig S, Chen W, Lee PVS, Whitton RC, 2014. Bone fatigue and its implications for injuries in racehorses. Equine Vet J 46, 408-415. Because it is time consuming, costly, and potentially unethical to assess the effect of different training loads on subchondral bone fatigue in racehorses, we have developed a mathematical model to better understand this complex process. In our model, we looked at the effects of incremental changes in training load for untrained two-year-old racehorses, for trained racehorses that had rested (spelled) for at least four weeks, and for trained racehorses that are currently in training for more than four weeks. The model showed that even with the most rapidly progressive training regimen it takes about 16 weeks of training for complete adaptation of bone to racing speeds for a young horse entering training for the first time. In practice it will take longer because training speeds need to be built up slowly to avoid injury in a poorly adapted skeleton. There are no shortcuts. Complete adaptation may be several weeks less for racehorses that have undergone at least one full preparation. Conversely bone loss can be quite rapid when race training is interrupted. The model shows that even with relatively short rest periods of ten days there is the potential for a 10% loss of bone in areas that undergo high loading when galloping. This makes the bone considerably weaker and therefore prone to injury if high speed exercise is reintroduced too quickly. Based on the model the bone loss as a result of a 10 day rest will take 20 days to be replaced following the careful reintroduction of training. Intense speed work should be avoided during this period. As we refine this model further we will incorporate variations of training intensity to better mirror actual racehorse training programs so that we can make more specific recommendations. In the meantime trainers need to be cautious in returning horses to work too rapidly if they have been rested from training for longer than a week. This study is one part of the Equine Limb Injury Prevention Program and is funded by Racing Victoria Ltd. (RVL), the Victorian Racing Industry Fund (VRIF) of the Victorian State Government, and the University of Melbourne.